On Friday, April 1, the United States Mint released its 2016 Proof Set for $31.95. The annually issued collector product logged 3-day sales of 185,624 sets. The sales start is about on par with other recent issues. Sets over the years have launched in different months and on different days of the week — usually on Mondays, Tuesdays or Thursdays, affecting their first-reported sales totals. Keep that in mind when looking at the figures in the table below. 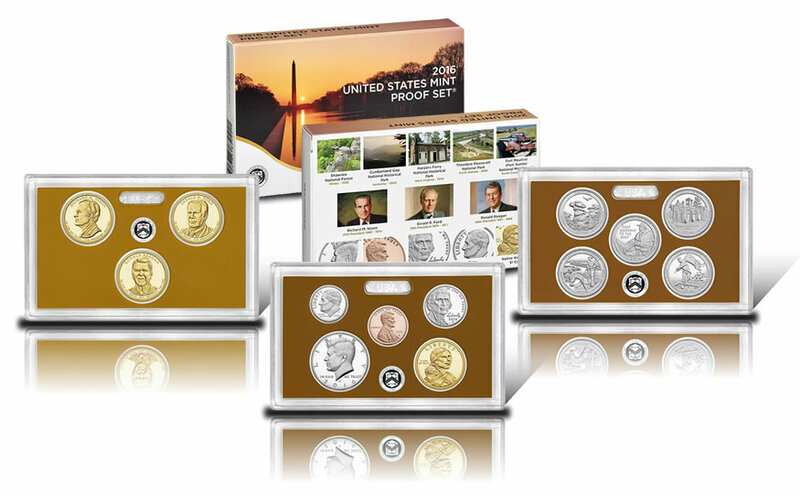 *The 2015 Proof Set is still available, advancing in sales by 935 from a week ago to 640,620. This year’s set includes 13 proof coins from the San Francisco Mint, including the 2016 Native American $1 Coin, the three 2016 Presidential $1 Coins, the 2016 Kennedy half-dollar, the five 2016 America the Beautiful Quarters, the 2016 Roosevelt dime, the 2016 Jefferson nickel and the 2016 Lincoln cent. All but four of the coins feature designs that are unique to this year. 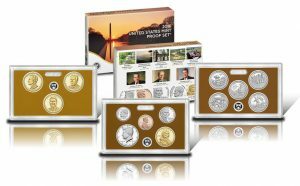 Annual sets are available from the U.S. Mint’s online store, located here, or by calling toll-free at 1-800-USA-MINT (872-6468). Wow! The sales of these inexpensive core annual sets keep getting lower. They haven’t sold over 1 million sets in any year since 2011. The hobby is slowly dwindling. Sad thing for sure. The price of the basic core sets is slowly killing the hobby. Agreed, it’s a shame. If the price came in around $15, I think the sales would leap. You are right. IMHO they should be priced about $26.95 like they were a few years ago, especially since base metal prices have plunged last year & this year. There is one less coin in this year’s set & they will have 3 less coins in next year’s set. I don’t think that I have seen a “kid” at a coin show, looking to complete a series of dimes/quarters/cents like I assume we all did when younger, in many many years. The industry has priced itself out the reach of the younger collector. The interest/market for non GEM mint coins is getting smaller and smaller each passing year. I still have the first coin I ever bought from a store back in 1975, (1862 cent) as a teenager, but when I look around the shows today, the youngest person is approx 50 years old. I agree totally with you. I am 50 & the youngest member of my local coin club! At least I have 4 nephews who live out of state who will inherit my collection. I buy them some inexpensive coins as gifts, but they prefer computer games & toys. You are so right ,, The price of the coins have gone so high . It was fun at one time to collect,, But now ,, With all the coins that they put out ,, And the high price it’s not fun no longer. Wait a few years and buy them at a lower price on the secondary market. Let someone else take the loss.